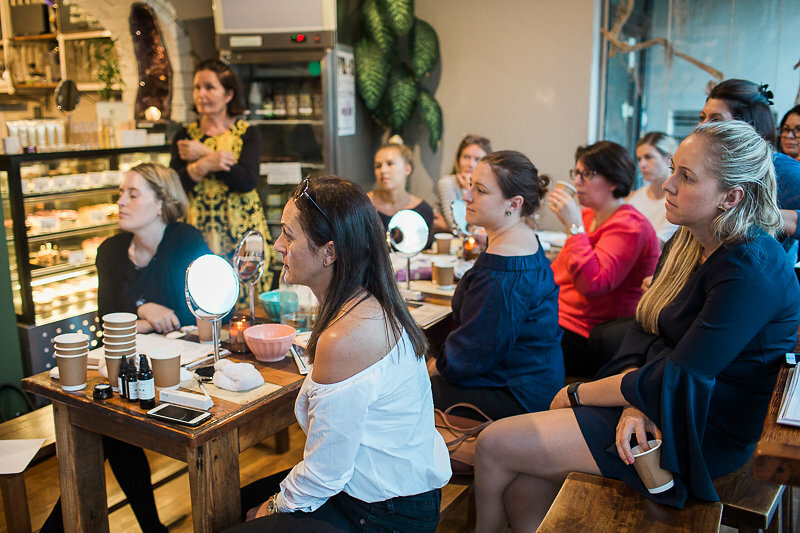 Our Summer Glow Workshop- Roundup! There was so much to tell, teach, demonstrate and play with! Anna had everyone mix a fresh turmeric face mask to apply, Julideliciousmonstrated the most delicious treats (I also learned a thing or two about food preparation!) and I followed with a simple Summer Glow look, talking all things foundation, highlighter and radiant cheeks. The look we did was quite similar to my day-to-day makeup, which you can see in this video. I was using my fave Jane Iredale Foundations: Liquid Minerals, Glow Time & PurePressed. The key is to find the right one for your skin type and needs. And I really can't seem to get enough of the vegan lip&cheek carrot colour pots & vanilla highlighters by Ere Perez. We used all the beautiful skincare products for prepping the skin by Edible Beauty, which I also featured in detail in this video. We were also lucky to have the talented Gaby @ Gabriela Fearn Photography, shoot some behind the scenes of the event for us. Thank you, Gaby!!!! As usual, I had little Faye in tow, while she had a great time with daddy and coming to visit for a while, she definitely had enough of it all by the end of the night. I totally pushed her bedtime a little too far. Mama has still a lot of learning to do. Oops. Forgive your silly Mum, little one, I am trying my best. She has been amazing tagging along with my gigs and I make sure that she gets my full attention and presence when we spent time together. I might write a little piece about this working mum business sometime soon! If you know me, have been reading this blog or are following me on Instagram you have probably noticed that I am vegan. I believe this is the kindest, healthiest and most respectful lifestyle and like all normal, loving parents, I will do what I think is best for my children. Yes, absolutely! Please read on if you are interested in the scientific evidence and also a great video interview with a professional!
" It is the position of the American Dietetic Association that appropriately planned vegetarian diets, including total vegetarian or vegan diets, are healthful, nutritionally adequate, and may provide health benefits in the prevention and treatment of certain diseases. Well-planned vegetarian diets are appropriate for individuals during all stages of the life cycle, including pregnancy, lactation, infancy, childhood, and adolescence, and for athletes." I realised that many people are very misinformed when it comes to nutritional advice. Although I always do the very extended research myself, I wanted to share an expert interview with you on this topic. I am very thrilled to have been able to speak to the well-respected Naturopath & Health Science Expert Robyn Chuter, who is much more articulate than I am and also a professional in this field. She will share with you the scientific evidence that supports plant-based eating. I really hope you enjoy this special in-depth interview that will help you understand more about how and why vegan children are thriving. I have promised you over at our Liv+Dave+ Blog to share our favourite porridge recipe with you, which we are having day in and day out. With tiny variations. We have lately started adding some super foods and now this recipe is not only super healthy but also amazing for your skin. I have been trying to ignore the fact that Winter hit Sydney, but with today being the shortest day of the year, I have come to terms with it. The heater is pumping, I am wrapped in socks and scarf while sitting in my office and sipping herbal teas. Actually, I am having two cups going at the same time. Today is supposed to be a powerful Winter Solstice paired with a full moon, which I learned this morning in my yoga class. It's a time for new beginnings, a time to reflect and do a little less. Inspired by this short cold day, I decided to really embrace Winter this year. I would love to hear of your rituals, too. I am reducing my caffeine intake at the same time and will only have the occasional coffee. Taking Baths! It's quite an act of self-love and indulgence. I love using Magnesium bath salts, which are extra relaxing and soothing on sore muscles. I am aiming to schedule in more time for baths during this cold season. Winter is the perfect time for Soups! We are mixing it up over here and trying out all sorts of combinations. Pumkin, Cauliflower, Mushroom... We love warming spices like Ginger and Chili, which are warming. Morning runs were skipped lately, not only because it's fresh outside, but mainly because it's too dark in the early morning. So we are doing some Kundalini Yoga over here in our loungeroom every morning. We put the heater on and cosy lighting. It's just the best way to start the day. This might develop into a little Winter Series with more concrete recommendations & tips.